Through Laura’s Lens: Plant Societies Have it All! How do you tie a Hawaii theme to your Flower Show exhibit when you’re the American Ivy Society? Easy—you grow topiary surfer penguins. Topiary surfer penguins??? Who knew penguins could surf? 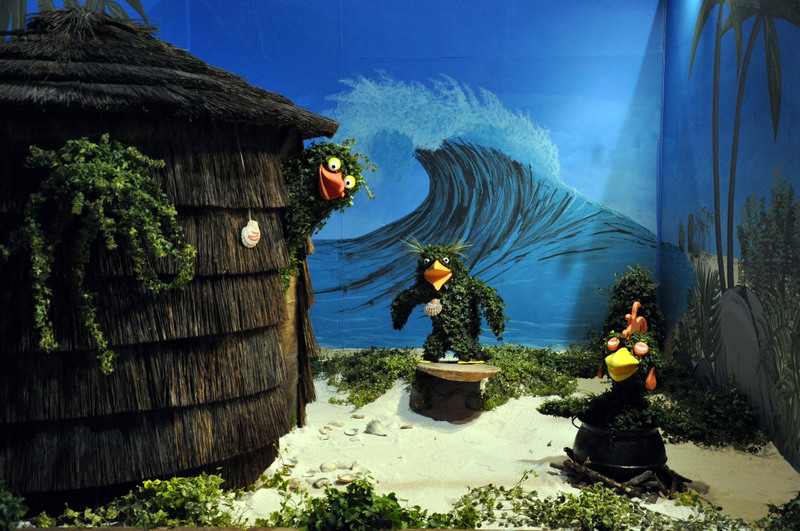 That’s right, this whimsical exhibit takes its theme from the animated film Surf’s Up, a behind-the-scenes look at the annual Penguin World Surfing Championship, set in Hawaii. It showcases many wonderful varieties of ivy and highlights its versatility in many garden settings, including topiary. Several plant society exhibitors pack a lot of creativity into small spaces and make a charming Flower Show “neighborhood.” Take time to get to know your ivy, ferns, cacti, rhododendrons, orchids, and rock gardens. You should consider joining up with all these great groups; it’s never too early or late to pick up a new hobby and make friends in the process. After the jump, learn about each plant society and see what they created for the 2012 Show! Looking for Flower Show Info? Flower Show Cyber Monday Sale Starts at Midnight! Won’t You Join the PHeaSt?